In 1941, Walt Disney was at a crossroads, breaking box office records with his first feature “Snow White and the Seven Dwarfs” (1937), but losing money on both “Pinocchio” (1940) and “Fantasia” (1940), which are now deemed classics but struggled on the brink of World War II. As a result, Disney set out to make his next project a simpler, cheaper effort in an attempt to recoup some money. Thus, we got “Dumbo,” clocking in at a truncated 64 minutes and using watercolor backgrounds instead of the traditional oil paints. The low-budget gamble worked, as “Dumbo” became the most profitable Disney film of the 1940s, such a cultural hit that Time magazine nearly dubbed Dumbo its “Mammal of the Year” until the attack on Pearl Harbor. And yet, for all its success upon its release, “Dumbo” remains one of the more dated films of the early Disney canon, from its cell animation to its controversial Jim Crow flock. This is probably why it’s getting such a massive makeover this weekend in Tim Burton’s new live-action remake of “Dumbo,” which eliminates too many of the beloved elements of the original classic for a relentlessly gloomy endeavor that’s way too sad for its intended child audience. Once again, the pachyderm plot focuses on an adorable baby elephant named Jumbo Jr., whose oversized ears earn ridicule by circus crowds chanting “Dumbo” (the way he gets the moniker here is actually quite clever). After his protective mother is hauled away as a “mad elephant,” Dumbo must discover his ears’ hidden potential to make him a famous flying circus star in the hopes of earning enough money to someday be reunited with his long-lost mom. Unlike the cartoon, there are no anthropomorphic animals. Yes, the original Dumbo and his mother didn’t speak, but there were countless other talkers like the Stork, who was originally voiced by Sterling Holloway (“Winnie the Pooh”) but barely appears here as a silent homage. More importantly, the crucial sidekick of Timothy Q. Mouse is nowhere to be found. It was a bit of meta voice casting in 1941 to have Timothy voiced by Edward Brophy, who had recently starred in Tod Browning’s circus critique “Freaks” (1932), but fans want to know: How do you remake “Dumbo” without Timothy? That’s like remaking “Pinocchio” without Jiminy Cricket. Instead, the script focuses on a collection of new human characters. They’re all superbly cast with Danny DeVito as the barnstorming ringleader, Michael Keaton as the crooked Coney Island circus entrepreneur, Alan Arkin as his enabling Wall Street tycoon, Eva Green as a French trapeze artist, Colin Farrell as a widowed one-armed war vet, and Nico Parker and Finley Hobbins as his kids, who become kindred spirits with Dumbo in missing their mothers. No matter how good the cast, it’s unsatisfying to have the beloved title character so passive in his own story. Dumbo should be the one driving the action, not kicked along as an unwilling participant. It’s an odd choice by screenwriter Ehren Kruger, who has penned underrated thrillers in “Arlington Road” (1999) and “The Skeleton Key” (2005), solid horror spinoffs in “Scream 3” (2000) and “The Ring” (2002) and three trash “Transformers” sequels (2009-2014). This once-trippy pink nightmare is the one time I wish Burton would have gone all-out in pinstriped hypnosis. Instead, he sanitizes that moment, while making the rest of the movie dark with a muted color palette by cinematographer Ben Davis (“Captain Marvel”) and a brooding score by Danny Elfman (“Batman”). The most Burton-esque scene paints Keaton at a back-lit desk just like Jack Palance’s death scene in Gotham City. Fans won’t miss the irony of Keaton’s Batman outsmarting DeVito’s Penguin in a showman showdown of rival ringmasters. I don’t need to defend Burton’s cemented place in film history. He’s made more great movies than most peers of his era: “Pee Wee’s Big Adventure” (1985), “Beetlejuice” (1988), “Batman” (1989), “Edward Scissorhands” (1990), “The Nightmare Before Christmas” (1993), “Ed Wood” (1994), “Big Fish” (2003), “Corpse Bride” (2005), “Sweeney Todd” (2007) and “Big Eyes” (2014). And yet for whatever reason, he has struggled when adapting preexisting children’s stories, from “Charlie and the Chocolate Factory” (2005) to “Alice in Wonderland” (2010). 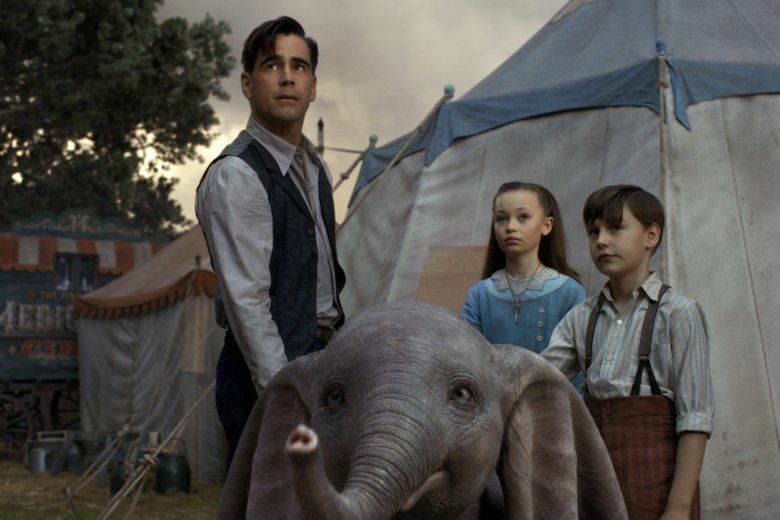 “Dumbo” sadly continues that trend with a joyless tone that misses the mark for its target audience. After all, this isn’t Fellini’s “La Strada” (1954); this is a Disney movie intended for small children. Walt Disney famously said, “For every laugh, there should be a tear.” This time, for every tear there’s another tear. Dumbo’s mom is locked away? Don’t worry, the kids’ mom is dead too! Their dad lost his arm in the war! And just when you think the bad guy is killed, here’s an even meaner villain for ya! The onslaught of sadness is depressing and unintentionally comical. Where’s the funny Olaf sidekick? We needed Thumper and Flower to cheer us up after the death of Bambi’s mom. The same goes for Timon and Pumba after Mufassa’s death. In the live-action “Dumbo,” we get no therapeutic rebound because the one character who originally served this purpose (Timothy) has been removed. Comic relief isn’t mere peanuts; it’s vital. Even the “triumphant” scenes are moments of narrowly averted crisis where you sigh with relief rather than cheer with delight. It’s always two steps backward, one step forward. It also becomes repetitive, as the original “Dumbo” built up to the big elephant flight at the climax, while the new “Dumbo” shows the miracle at the midpoint then repeats it over and over. By the time we reach the Coney Island climax at the nightmarish Dreamland, children will be terrified of the spooky shadows of the park’s deadly carnivores, while discerning adults will question why the deep bench of circus performers sent the one-armed man to climb the tent. In the end, the tacked-on falling action feels less like a satisfying conclusion and more like a forced public service announcement about animal cruelty. This surely mirrors the downfall of Ringling Bros. but it’s hypocritical considering the “good guys” kick Dumbo to get him to fly. As someone says of the climatic circus-tent collapse, “That was a disaster.” I won’t go that far — the cast and CGI are way too impressive — but one little girl nailed it as she left the theater. Here’s hoping “Aladdin” and “The Lion King” are better choices this summer. Avijith is the author of Tolly buzz Websites, Avijith is a regular contributor to online article sites on the topics of Sports and league, she likes to write and read about sports.